A bunch of Fleece Artist boxes arrived this week. You’re going to love these gorgeous new kits. 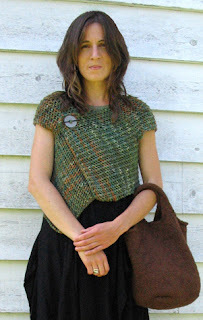 It’s a cute little top that’s knit in one piece with the luscious Scotian Silk, 65% wool and 35% silk on 6mm needles. We have lots of beautiful colourways. Very cool. They’re knit with Blue Face Aran, 100% wool, on 5mm needles. These are knit sideways in one piece, with Aran Alpaca, 50% alpaca and 50% wool, on 5.5mm needles. It’s a simple knit that translates into a beautifully soft and stylish sweater. Choose a stick from a variety of colours, including cranberry, violet, moss, ochre, blueberry, earth or birch. 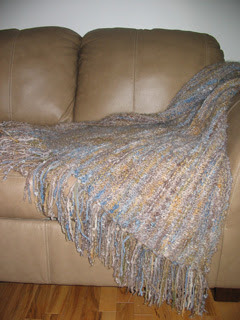 This blanket has a finished size of about 40″ x 60″. The kit includes 200g of Merino Boucle, 200g of Super Kid Loop and 500g of Blue Faced Leicester, on 9mm needles. I just might have to have one of these. 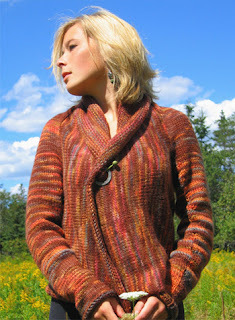 The striking textures, colourways and combinations of yarn in these kits is simply stunning. It is truly Fleece Art. 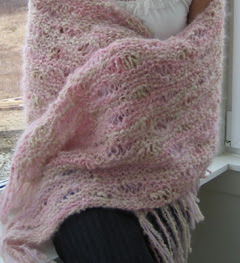 This kit contains 250g of Baby Alpaca and 250g of Mo and is knit on 7mm needles. Isn’t that a fine picture of warmth and coziness? I need one of those wraps right now. Brrr, winter’s coming, it’s definitely time to pick up the needles and knit something cozy and warm. This entry was posted on Wednesday, November 28th, 2007 at 1:34 am	and is filed under Uncategorized. You can follow any responses to this entry through the RSS 2.0 feed. Both comments and pings are currently closed.